Do you need help to buy tickets for Procol's Castle Concerts at Lejre in August (quick, before they sell out!)? BtP's Danish contact will then buy the tickets for you, and they will be available for collection at the Palers' Revels (in Lejre, where Ledreborg castle is) or at Palers' Basecamp Hotel before the concert(s). We'll send you an e-mail to confirm that the tickets have been purchased on your behalf. The price for each adult ticket (including PayPal fees etc) will be USD 54. Although the Procol orchestral shows are sold-out (Saturday) and likely to sell out (Sunday), BtP has acquired a supply of tickets for both shows. These will be made available to people who book for the after-show parties as well. Tickets are available at the BtP Shop. 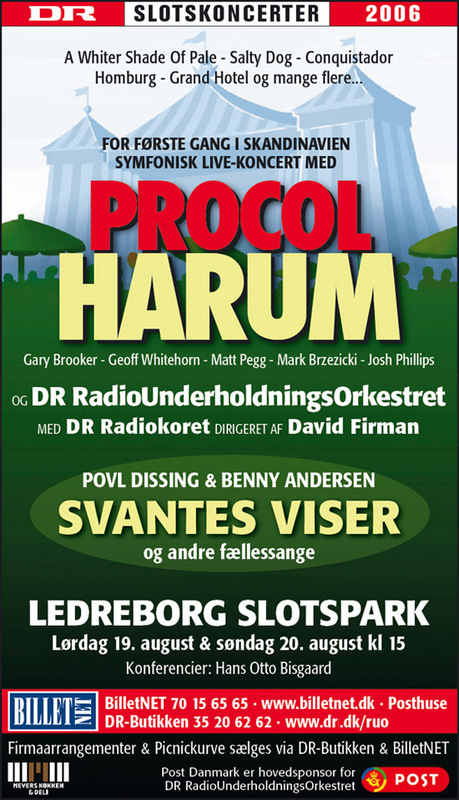 Procol Harum will play two shows with The Danish Orchestra (Denmark's version of the BBC orchestra) on Saturday and Sunday 19 and 20 August. 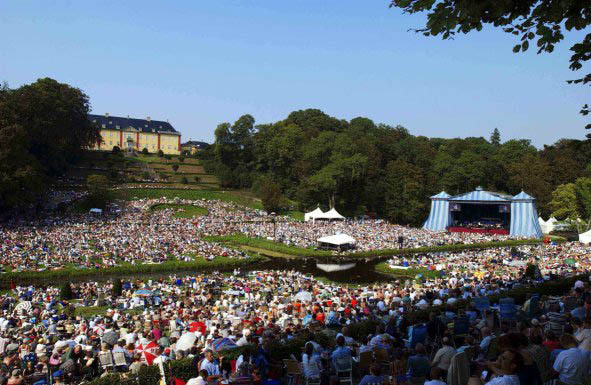 We understand this symphonic weekend at Ledreborg Castle is part of a series that sells out every year. Good that 20,000 people will hear the band! But if you plan to go, you will need to book your tickets without delay. Here's how to do it: go to the website and choose your day, 19 August, 20 August, or both. (There will be Palers' Revels ... music, food, drink, great company ... after each gig at about 7.30 pm: details tbc). Note that you cannot book both PH gigs at the same time! This means you will probably end up paying postage twice if you're going to both shows. You'll want unreserved seating (there are no fixed seats) which is category A. The ticket price is 295 Krone (about 25 GBP). A child's ticket is 70 DKK. You don't need to choose a picnic ... we understand that you can take your own food in if you wish ... but you'll have to buy drink there, rather than taking in your own. Choose whether you want standard mailing, or registered mailing. Then click to fill in the form, and the job's done. There is good reason to suppose that this will be a very special pair of concerts. The venue (website here) is the beautiful Ledreborg Castle, built in the 1740s, one of the most romantic privately-owned stately homes in Denmark. The Palers' Revels at this time: details here. Note that www.billetnet.dk lists another Procol Harum show, for 10 November. This autumn show is not contractually confirmed, Procol management informs us.